Vodka originally was made from rye, but other fermenting grains -- including wheat, barley and corn -- can also produce vodka. Manufacturers may use essences of citrus or other fruits, such as blueberries, to flavor vodka. 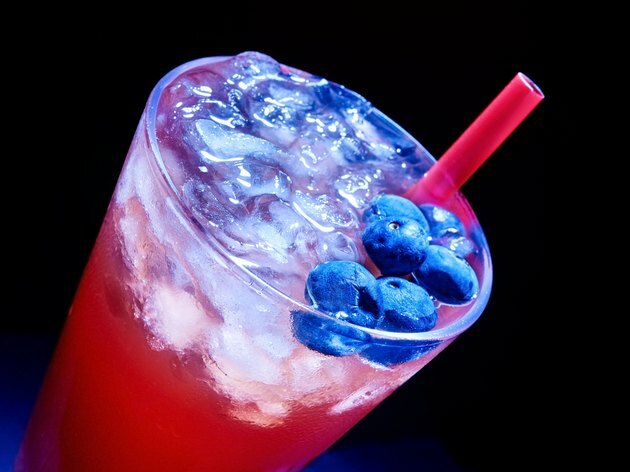 Blueberry vodka contains about 69 calories per 1-oz. serving. Unflavored vodka contains similar calories, about 64 calories per 1-oz. serving. Most shot glasses contain 1.5 fluid oz. Therefore, a shot of blueberry vodka contains about 104 calories, according to Drinks Mixer and Fat Secret. None of the calories in blueberry vodka come from carbohydrates, despite the carbohydrate origins of blueberry vodka. Although alcoholic products produced by fermentation can leave behind traces of carbohydrates, vodka, produced by distillation, is ethyl alcohol, a zero-carbohydrate liquid. None of the calories in blueberry vodka come from fat. Vodka in general and blueberry vodka specifically contain no fat, no protein, no sodium, no cholesterol, no fiber and no sugar.